The POS Interface Scale - "Countertop or Countersunk" can either be interfaced to a compatible Cash Register or POS System. It is a very heavy duty scale designed for high volume establishments. It is designed for either countertop use or can be countersunk. Countersunk use would require a customer pole display in order to comply with consumer protection law. 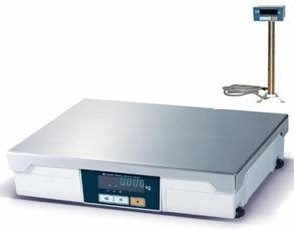 When the POS Interface Scale is linked to a Cash Register or POS System via the communications port, item(s) are simply placed on the scale platter to weigh. The relevant product button on the Cash Register or POS System is pressed which transfers the weight for price calculation. The Access POS Retail Software has scale interface as standard as well as many of our mid to high range cash registers. The scale can either be purchased as either 15kg (Max. Weight) x 5g (Increments) or 30kg (Max. Weight) x 10g (Increments). Additional display options are also available. Initial Programming and setup is included in the price (System Options). After your purchase, an Access POS representative will contact you to discuss the various programming options prior to freighting the POS Interface Scale - Countertop or Countersunk. PROSPA PAY Buy over 13 weekly payments of $ 88.46 (ex. GST). No Interest ever and No Fees if you pay on time. Contact Prospa Pay online at PROSPA PAY or call 1300 706 983 for a simple over the phone application. No obligation. SILVER CHEF Rent-Try-Buy. Rent from $ 14.60 (ex. GST) per week for a minimum of 12 months before you decide to either Buy (with 75% of prepaid rental being deducted from the original cash price), Upgrade or Return at no further obligation. Apply online at SILVER CHEF or call 1800 337 153 for a simple over the phone application. No obligation.